If you are a coffee lover, finding the perfect coffee brewer can prove to be an uphill task. However, picture this, sleek of design and packed with ultimate functionality, the BUNN BT Velocity Brew 10-Cup Thermal Carafe Home Coffee Brewer is in a class of its own. It’s the dream coffee maker for every coffee lover out there. 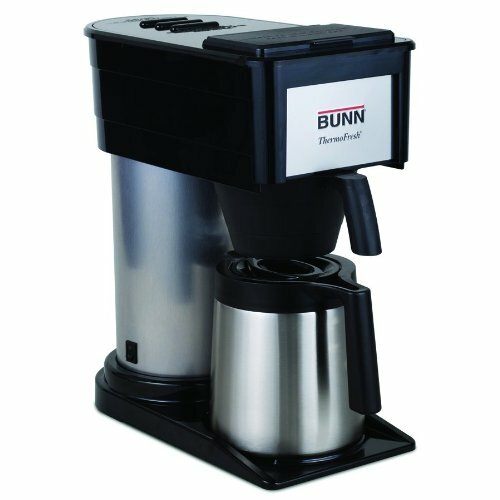 Constructed of stainless steel and sturdy plastic, the bunn velocity brew comes equipped with a thermal carafe which serves to ensure your brew stays heated up for up to two hours. Further, it not only brews fast but will also do that for up to 10 cups maintaining the same efficiency and quality. Furthermore, for only about four minutes, you will be enjoying a hot cup of coffee and if anything ever goes wrong, you have a three year warranty to fall back on. Let’s thus delve into the specific features that make this coffee brewer an epitome of the industry. First and foremost, you are likely to be caught by the awe aspiring design. Unlike its predecessor which was made purely of plastic. With this coffee brewer, your kitchen will also look chic. Suffice it to say, it’s just beautifully put together and much thought was definitely given to the design. The second feature that gives the BUNN BT Velocity Brew 10-Cup Thermal Carafe Home Coffee Brewer an edge over every other brewer out there is its speed. As aforementioned, in just a couple of minutes you will be filling your crosswords while sipping away your coffee. However, if you are wording how quality is maintained at that speed, then its unique spray head can explain that. Water is showered fast and evenly on your grounds ensuring they float to maximize extraction. With water being heated to an ideal temperature of 200 degrees, quality is definitely guaranteed. Additionally, the vacuum insulated thermal carafe must also entice you since you do not want to be making your coffee every other minute. Furthermore, it saves on energy. Finally, even the manufacturers believe in the bunn velocity brew and thus a three year warranty will serve to assure you of the quality of the product. As with every product, there is a downside. With the BUNN BT Velocity Brew 10-Cup Thermal Carafe Home Coffee Brewer, being a pre-immersion brewer, you are required to heat the water in the velocity brew 15 minutes prior to brewing. If for any reason whatsoever you power down your bunn velocity brew, you would have to reheat the water again when you power it back up. Additionally, lack of a timer may be a bother to some. Despite its efficiency, it would have been nice if you could program it to brew at certain specific times and have your coffee ready whenever you want it. An eye candy for every kitchen table top, an efficient and fast brewer and despite the water pre heating requirement, the BUNN BT Velocity Brew 10-Cup Thermal Carafe Home Coffee Brewer ensures it delivers your coffee on a platter just how you like it. It’s definably a must have.